The supermarket chain and software company were two of the stock market's best performers as indexes dropped sharply. 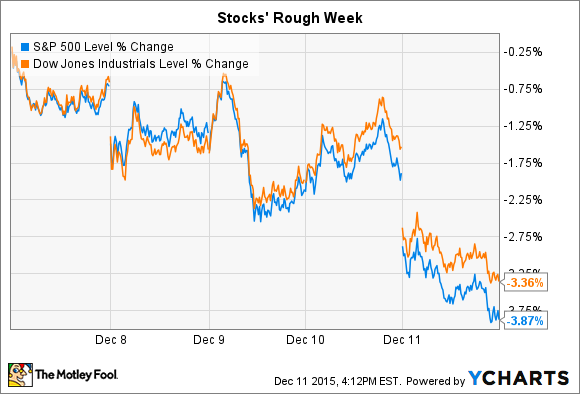 Stocks ended a bad week on an even worse note. The S&P 500 (SNPINDEX:^GSPC) and the Dow Jones Industrial Average (DJINDICES:^DJI) both ended the trading day near session lows, losing roughly 2% each. For the week, the S&P 500 shed almost 4%, while the Dow gave up 3.4%. Sharply falling commodity prices again put pressure on energy companies and the broader market. Crude oil fell to below $36 per barrel, touching its lowest level since 2009. Individual stocks on the move included Whole Foods Market (NASDAQ:WFM), which could be enjoying a rebound in customer traffic, and Adobe Systems (NASDAQ:ADBE), which posted strong third-quarter earnings results before the opening bell. With its 9% jump today, Whole Foods was the S&P 500's biggest percentage-point gainer. The rise helped the supermarket chain's shares notch a hefty 14% increase for the week. Yet the stock is still down 33% since the beginning of the year, as increasing competition has hurt Whole Foods' earnings results. After revealing negative third-quarter comparable-store sales growth last month, CEO John Mackey noted in a conference call that, when it comes to organic groceries, customers now have more choices than ever (70,000 new purchase points during just the last three years, according to one estimate). "In this dynamic and increasingly competitive marketplace," he said, "we recognize we need to move faster and go deeper in creating a solid foundation for our long-term profitable growth." Despite initiatives to compete better on pricing and selection, at the time management issued a forecast that implied things would be getting worse before they got better. Comps should decline by 2% in the current quarter, it said, and then slowly improve as Whole Foods progresses through the next three quarters of its 2016 fiscal year to end with positive comps of 3% in Q4. But that forecast might prove conservative. Today market research firm ITG released a note saying that Whole Foods' comps are slipping by just 1% this quarter compared to that 2% official forecast. The supermarket chain's earnings results are highly dependent on this sales-growth figure. If the comps trend is significantly better than management had expected, investors should see Whole Foods' profit trajectory quickly improve. Software giant Adobe Systems saw its stock rise 3% today after the company posted strong third-quarter results. Revenue hit a new high of $1.31 billion, or 22% above the prior-year period. Earnings improved at a much faster pace, spiking 59% higher, to $0.62 per share. "Our record revenue and strong momentum are a reflection of our industry-leading content and data solutions in Digital Media and Digital Marketing," CEO Shantanu Narayen said in a press release. The financial advantages of Adobe's shift to subscription, cloud-based services shined through in these results. While gross profitability held steady, operating margin jumped up to 22% of sales from 12% a year ago. Adobe's recurring, subscription services continue to grow at a faster pace than the rest of the business. Subscription revenue accounted for 69% of the business this quarter, up from 58% last year. Management expects this positive momentum to continue into the new fiscal year. In a conference call with investors, Chief Financial Officer Mark Garrett provided 2016 guidance that calls for a 20% revenue improvement compared to 2015's 16% rise. Profit should rise by 30%, to $2.70 per share.